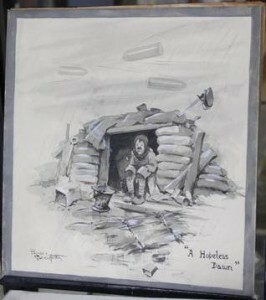 Bruce Bairnsfather art and collectables – Throughout the horrors of the First World War, artist Bruce Bairnsfather managed to raise smiles with his drawings of life in the trenches. But who was he? Pictured: Bruce Bairnsfather (British, 1887-1959) “A Hopeless Dawn” (left); “They’ve Evidently Seen Me” (right) Sold at Bonhams, Oxford for £2,640, Sep 2010. Image Copyright Bonhams. Born in 1887, Bruce Bairnsfather’s talent for drawing soon emerged, and he was forever in trouble at school for illustrating the margins of his textbooks. When the War broke out, he joined the Royal Warwickshire Regiment, and was horrified at the conditions in France in the rat-infested trenches. To cheer himself up he began to draw cartoons, inspired by the soldiers, trenches, sandbags and shells all around him. One cartoon was especially well-received by the men – it showed a group of soldiers in a sandbagged shelter anxiously asking “Where did that one go to?” as a shell landed close by. Bruce decided to send the drawing to a magazine called ‘Bystander’, who published it. It proved so popular that Bruce became a regular contributor and his cartoons were later published as a series of anthologies entitled ‘Fragments From France’. Many of these cartoons were produced when Bruce was convalescing back home in England after being wounded in 1915 at Ypres. He was one of that special band of ‘Old Contemptibles’, the nickname given to soldiers who had served in Mons from the start of the Great War in 1914. He just escaped being court-martialled after communicating with German soldiers at Christmas, in what later became known as ‘The Christmas Truce’. Pictured: Three Grimwade’s Bruce Bairnsfather plates 1917 transfer printed in brown hues with WWI scenes of trench life, captioned. Sold at Bonhams, Bury St Edmunds for £120, Oct 2010. Image Copyright Bonhams. Bruce’s drawings were a mix of wry humour and hard fact, and must have vividly conveyed the horrors and tedium of life in the trenches to loved ones back home. Many of the drawings featured a dour, chubby-cheeked soldier with a walrus moustache, and one day Bruce was asked the name of the soldier who appeared in all the pictures. “Oh,” said Bruce, thinking quickly. “That’s Old Bill!” From then on, the character had a name and acquired a following. Gradually some of the other characters in the cartoons acquired names too; Alf, Bert and Old Bill’s wife Maggie – but it was Old Bill who was the star. 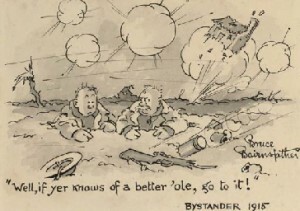 His popularity was boosted even more when Bystander published the Bairnsfather cartoons as postcards, selling them as a series of nine sets of six cards labelled ‘Bystanders. Fragments from France’, followed by the series number. Today, many of his cards can be bought quite cheaply, depending on condition. Pictured: Bruce Bairnsfather (1888-1959) ‘Well, if yer knows of a better ‘ole, go to it!’ signed ‘Bruce/Bairnsfather’ (lower right) and inscribed and dated ‘”Well, if yer knows of a better ‘ole, go to it!”/Bystander 1915′ (lower middle) black ink and grey wash 6¼ x 8¾ in. (15.8 x 22.2 cm.). Sold at Christies, London for £1,320 December 2007. Image Copyright Christies. To the modern eye, these sepia postcards are unexciting – until they are examined closely. It’s only then that subtleties and small details are revealed, things that only a man who had suffered life in the muddy trenches would know. The experience of war so traumatised Bruce that it affected his character, turning him from a jovial outgoing person to a sombre, retrospective man. Grouchy cards such as Old Bill clutching a tin of the inevitable wartime mix of plum and apple jam, with the plaintive comment “When the ’ell is it goin’ to be strawberry?” were deservedly popular with the public, while Bill’s reply on being asked the daft question “What happened?” when his comrade saw a shell-hole in a wall is surely a classic. “Mice”, he said laconically. However, the drawing which really made Bruce’s name (and made Old Bill a household word) showed two soldiers sheltering from the shelling in a large hole. Obviously, one of the soldiers must have been grumbling, because Bill’s terse reply of “Well if you knows of a better ’ole, go to it,” summed up the War’s futility and must have raised many chuckles at a time when laughter was scarce. Old Bill’s exploits captured the nation’s hearts, and people eagerly turned to each issue of Bystander to see what he was up to. The detailed drawings helped women visualise just what their husband or boyfriend was experiencing. Here were the trenches, mud, sand-bagged dug-outs, shells, monotonous diet, barbed wire, enemies, rifles, boredom and – above all – that dry, British humour which kept those soldiers going. No wonder that the drawings were issued as postcards; it was obvious that they would have an instant market. From today’s viewpoint, many of the cards have poignant undertones; whether people at the time saw the despair beneath the humour is a moot point. The cards entitled ‘In and Out’ I & II demonstrate this – the first depicts a group of soldiers just before they return to the trenches; they are morose and anxious. The second card shows the same group when they have left the trenches for the relative safety of a hut. Here they can read letters from home, have a drink, open parcels of goodies, sing lustily to a concertina, and generally relax. Today we know that the majority of those brave men would never return, but at the time, it was still an adventure. One of the saddest cards shows two soldiers stooping by a third who has obviously been killed by a shell. Chokingly, Old Bill says, “Bert! It’s our Officer”. Some of the cards, though, are still relevant today, and just as funny. One entitled ‘The Things That Matter’ shows a harassed Colonel under siege at Loos, sheltering from the shells exploding all around. He has just answered the phone to hear a disembodied voice requesting him to “Please let us know as soon as possible, the number of tins of raspberry jam issued to you last Friday”. Even today we all know the feeling when we are asked trite questions in the midst of utter chaos! 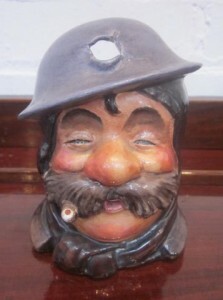 Pictured: A Royal Staffordshire Bruce Bairnsfather ‘Old Bill’ character jug. Sold at Bonhams, Oxford for £150, June 2013. Image Copyright Bonhams. As well as cards, Old Bill appeared on a variety of souvenirs, including plates, car mascots, playing cards and dolls. Popular at the time, and still collected today, are the various pottery items made by the Stoke-on-Trent company, Grimwades. 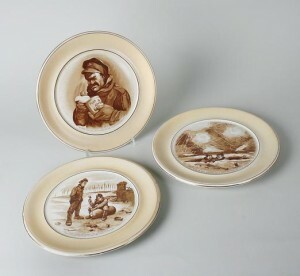 These pieces bear a sepia Bairnsfather cartoon – sometimes two – and amongst the many items to be found are vases, tobacco jars, ashtrays, plates, jugs, cups, saucers, teapots and various bowls. Often, the earlier pieces bear a touching backstamp: ‘Made by the girls of Staffordshire during the winter of 1917 when the boys were in the Trenches fighting for Liberty and Civilisation’. After the war had ended, in 1918, the stamp was changed, now reading ‘A Memento of the Great War’, or ‘A Souvenir of the Great War’, and they were so popular that they were made for several decades. There are so many around that it’s easy to collect the more common pieces. Naturally, the most favoured cartoon at the time was ‘A better ’ole’, so items bearing this particular cartoon are in abundance. The Old Bill dolls were made from printed cloth and velvet by J.K.Farnell & Co, makers of soft dolls and teddy bears, and today are very collectable. They wore khaki uniforms, balaclava helmets and, naturally, had huge walrus moustaches. Old Bill was also depicted as a crested china figurine, and as a mug, moulded in the shape of his features. In 1917 a play called ‘The Better ’ole’ proved exceedingly popular and ran for over a year in London. Nine years later a film based on the play, starring Syd Chaplin, brother of the more-famous Charlie, meant that Bruce was in great demand with people who wanted to meet the famed creator of Old Bill. Bruce was a reticent man, and the adulation made him feel uncomfortable, yet he was regarded as a national hero. A later film, ‘Old Bill and Son’, featured John Mills, and there was another play and a revue as well. Postcards and flyers advertising these performances make great additions to a Bairnsfather collection. 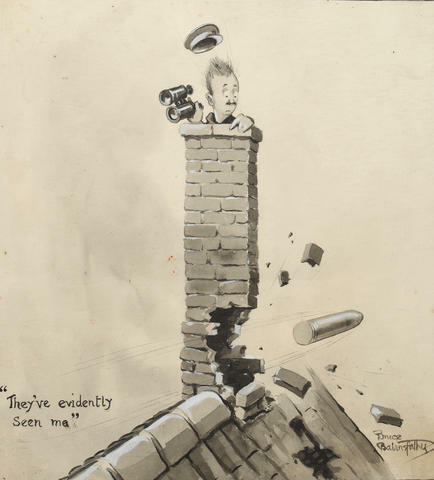 During the Second World War, Bruce was appointed official cartoonist to the American Forces in Europe, and contributed work to their ‘Stars and Stripes’ magazine. These magazines, as well as the earlier Bystander, and books such as his reminiscences ‘Billets and Bullets’ and ‘From Mud to Mufti’ would also complement a collection of Bairnsfather postcards, and are worth seeking out. Bruce Bairnsfather died in 1959, but his cartoon character, Old Bill, lives on, kept alive by enthusiastic collectors.